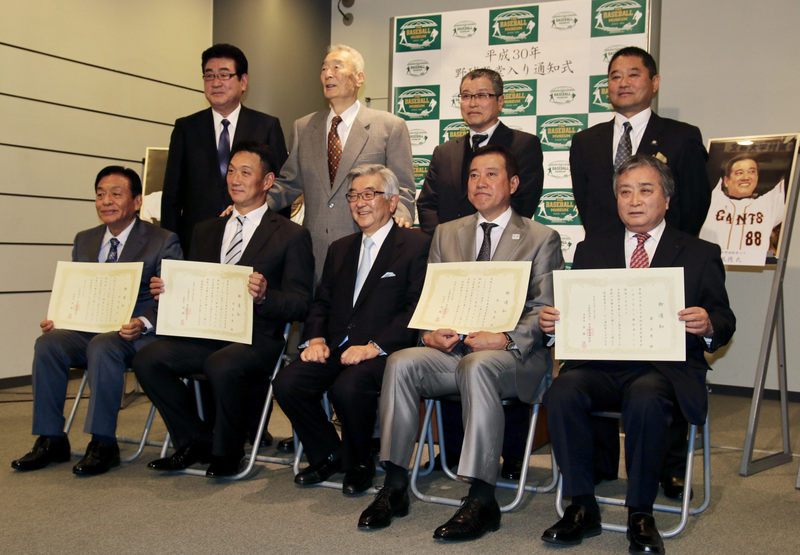 Kyodo News January 16, 2018 - Outfielders Hideki Matsui, Tomoaki Kanemoto and manager Tatsunori Hara were inducted into the Japanese Baseball Hall of Fame on Monday along with university manager Masao Taki. Matsui and Kanemoto were elected in their first year of eligibility, while Hara, who narrowly missed selection for his exploits as a third baseman, was selected in his second year on the experts division ballot, which considered his considerable accomplishments as a manager. Matsui, who spent most of his career with the Yomiuri Giants and New York Yankees, needing to be named on 75 percent of the ballots of selected veteran members of the baseball media, cruised in after receiving 91.3 percent of the votes. At 43 years, 7 months, he is the hall's youngest inductee. A three-time Central League MVP in his 10 seasons in Japan, Matsui went on to 10 seasons in the majors, where he was the MVP of the 2009 World Series. Kanemoto, who played for the Hiroshima Carp and Hanshin Tigers, not only ranks high in numerous career offensive categories, but also holds the record for consecutive full games played at 1,492. He needed 276 votes for induction and received 278. He was the 2005 CL MVP and won nine CL Best Nine Awards. He did all this despite not receiving regular playing time until he was 27. It is the first time two first-year-eligible players were selected at the same time. Four previous players had entered in their first ballot: Victor Starffin, Sadaharu Oh, Hideo Nomo and Kimiyasu Kudo. Hara, who was named on 73.2 percent of the players division ballots in 2015, his final year of eligibility, retired from managing the Giants later that year. His seven league titles place him seventh among Nippon Professional Baseball managers. He won the Japan Series three times and also managed Japan to the 2009 World Baseball Classic championship. Taki was a long-time manager at the high school and university levels. He led Chukyo University to 28 league titles, including 11 in a row and died in 2012.